in this post I am providing an anticipation of what you will read in my free weekly Newsletter I am going to send out on Sunday. My new eBook: “Key Concepts to Correct Trading Behavior” will be out on Tuesday, March the 19th 2013. 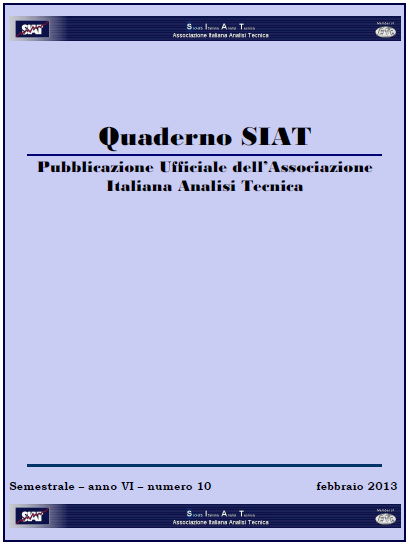 I will make it freely available for download upon registration in the ‘eBooks and Papers‘ page on the Blog. If you like this blog, please recommend it to your friends. If you want it to be better, please, leave me a feedback (comment below). If you intend to use this information for your trading please do your own due diligence, find the advice of a trading professional and trade at your own responsibility. The information provided is for educational purpose only. Please read the Disclaimer and accept all the risks. By piercing on the upside the level I have indicated yesterday,i.e. 1.3020, price confirmed the 1.2900 area of support. It does not mean that area could not be retested, but with a confirmation, a potential retest should now hold. The 1.3010 extension long setup on the 4-hour chart held yesterday and brough price into the 1.3060 area (1st target) and then the 1.3080 area (2nd target). Next support and long entry now at 1.3075. 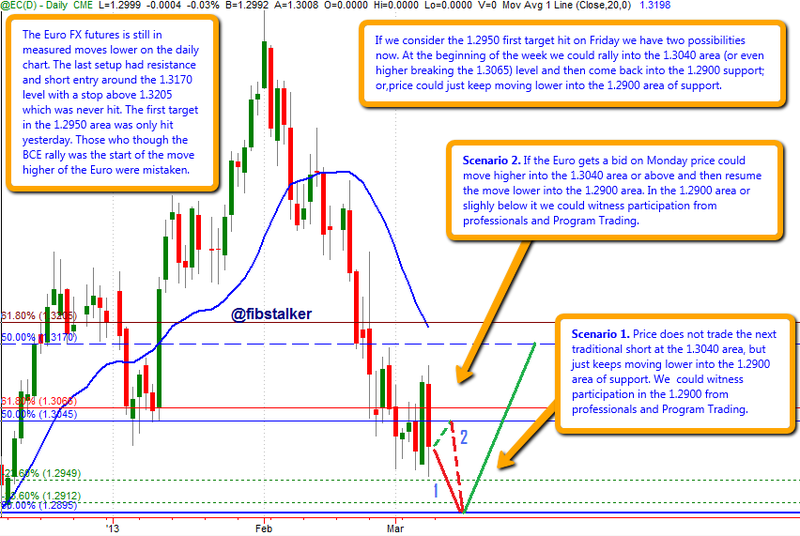 As anticipated (see the previous analysis) the Euro corrected down into the 1.2900 area, stopping today at 1.2931. I anticipate a bounce higher now from the current price level. We still don’t know exactly where the bounce will come from. Scenario 1. Price is now within an area in which we could see strong participation on the upside. Above 1.3030 (based on current lows at 1.2931) the confirmation of support will come and price will start a move into the 1.4080-1.41 area. The start of the move higher could come from lower levels at 1.2915 or even 1.2840, if price dips lower. Scenario 2. There is still a possibility price could keep moving lower past the 1.2769 and 1.2712 level (the latter ist he line in the sand). Below 1.2712 we could have a very high probable retest retest of the 1.2130 area of monthly support. However my belief is that scenario 2 has low probability at the moment. hereunder is the last review on the stocks I featured in my FibStalker View on Stocks sent on January 17th, 2013 to my Newsletter subscribers. I will normally publish this information reviews 8-15 days after they are shared with subscribers. The FibStalker View on Stocks review offers insights into stocks trading, setups and target information for the list of stocks I currently follow on my Blog. If you trade stocks or want to learn how to analyze them it is good to get the information I share timely. 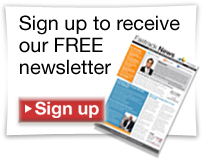 To do that you can register my free Newsletter, it only take 10 seconds. This week I will briefly review AAPL , ACN, BAC , BIDU , C, F, FB , GS, HPQ , NFLX and RIMM . The stocks with a (w=watch) after the ticker are those you want to closely monitor in the coming days because they could offer opportunities in the very short term on the daily chart. You can review the last video-analysis and plans for the stocks using the links provided below on the right of the stock ticker. On the longer-term timeframe this stock has a support in the 55 area with a first target at 71 (already hit) and a second target at 79.30. On the daily chart the support at 64.50 identified in November 2012 held and price kept moving higher and is on its way to the target at the 75.30 as anticipated in the previous analysis. If the stock will keep moving higher with the market the next target is at the 81 area. Price has been moving higher based on the setup provided on Jan 13th, so congratulations to those who took it and maintained the position. Price is now approaching the first target indicated at 12.70 area, however it has reversed in that 12.40 area that represent the beginning of a weekly area of resistance. A confirmation of that area of resistance with a continuation lower will be provided if price falls below the 11.50 level. Otherwise we could see price keep moving higher into 12.70 and then 13.40 (2nd target). In the past I have proposed price action forecasts for this stock. One of them was verified on Dec 18th, 2013. The levels indicated in this forecast are not random level, but they were rather derived applying the trading rules of the method, based on the observations of the effects of Program Trading on price. The swift move lower onto the 12.30 area where I anticipated long participation from Program Trading bounced and then came to make some sort of a second re-test of that support area. Stops are still below 10.80, which is the line in the sand. Below this level something is wrong and the stock will need to be re-evaluated. But, so far the long is still working and we have a target into the 21.10 area (1st target) and then 25.70 (2nd target). As price moved already above 16, after testing the 12.30 support area, the targets were confirmed. A retest of the 12.30 area could now hold and the stock has the potential to see the first resistance area at 38. 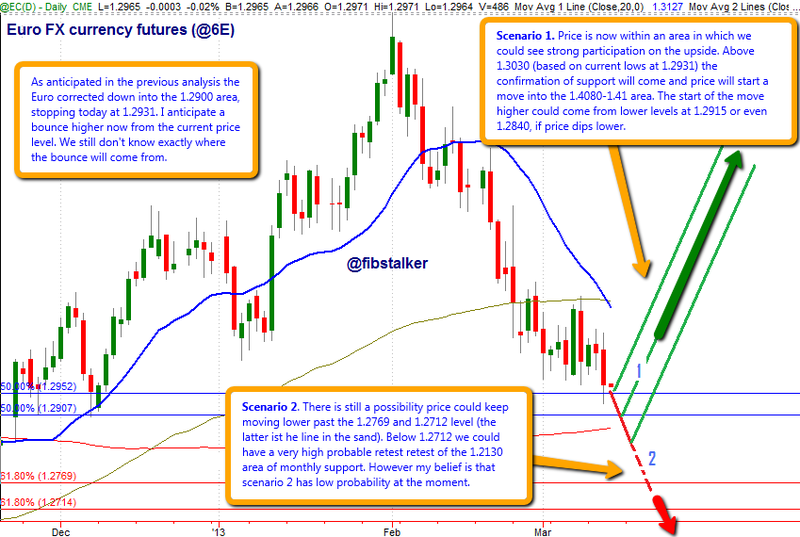 In the last review I have indicated the bullish scenario as the most probable, but the bearish scenario played out. The stock found short participation in the resistance area starting at 110.30 area and has been moving down in the last two weeks, with a gap down, which makes it more difficult to analyze price. In a continuation lower price should not move above 102.30. The short scenario as currently a target into the 74.45. The stock could be entered short in a retrace higher on the daily chart. The stock traded into and through that 44.40 level indicated in the last review.From these levels we could see a deeper retracement. If that’s the case the next retracement should come in the 42.80 area. Targets, in this case, would be at 45.50 (1st target) and then 47 (2nd target). On the other hand, if the stock keeps trading higher in extension the next stop will be the 46.20 area. The resistance starting at the 13.90 area kicked in at the beginning of February and there were participants on the short side who brought price into the next support area at 13. So far bulls kept defending the 12.65 level which is the line in the sand for a larger retracement into the 11.60 level. We have resistances at 13.40 and 13.90 (strong) areas and it still looks risky to go long at this level, although should the market keep moving higher, Ford could pick up from here with targets above at 14.90,16 and then 18.80 area. The market moved laterally on top of 13.00 support in the last two weeks, so you can still probe a long here or wait for a safer retracement into the 11.60 area, which could be reached if the general market makes a small correction. The last analysis on February 13th, 2013 is still valid.T he stock is currently reacting higher and price could be pushed into the next short selling entry area between 29.25 and 29.80, with stops above 30.50. The targets for the lager move lower is at 11.10, which will be confirmed if price moves below 23.20! On the smaller timeframe targets will be in the 26.20 and 24.50 areas, but given the larger target the potential for this stocks is very large too, with a potential 60% gain. The stock kept moving in a grind higher very similarly to the general market and it could correct swiftly with it. New longs look very dangerous in this stock and it would be better to wait for a larger retrace that, at current highs could bring prices into the 142.90 area before a new continuation higher. Nothing changed in this stock, although I can now see potential bearish developments. We have still two opposing setups. On the short side, the bears were able to defend the next weekly short starting at the 16.40 area and all the way into the 17.7 level that was never violated on the upside. Bulls, on the other side, were able and still supporting price in the 16.20 area. If this continues and bulls are able to defend the 15.80 threshold, there is a possibility of a continued move higher into the 18 area (1st target) and even the 19 area (2nd target). If bulls lose the 15.80 level it’s possible that price will slide into the 14.40 area and even lower to retest lows at 11.40. Stop-loss for long positions is still below 15.80. If you intend to use this information for your trading please do your own due diligence, find the advice of a trading professional and trade at your own responsibility. The information provided is for educational purpose only. Please read the Disclaimer and accept all the risks. Thank you. The Euro FX futures is still in measured moves lower on the daily chart. 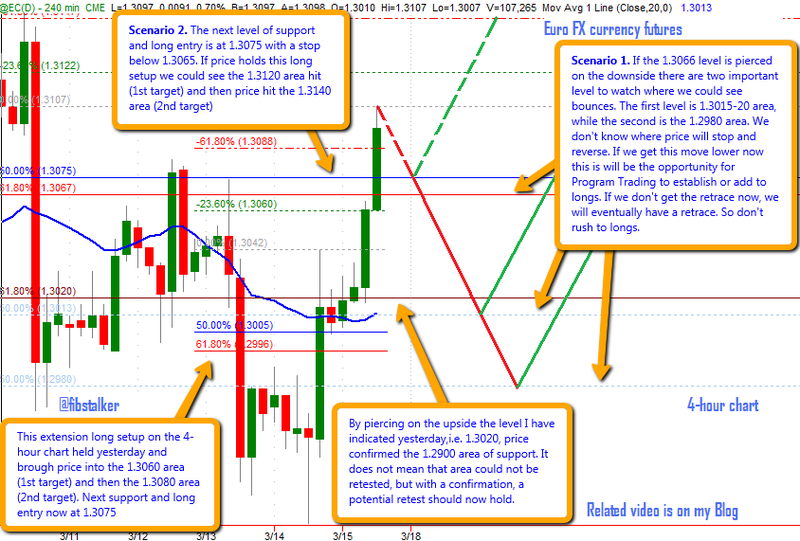 The last setup had resistance and short entry around the 1.3170 level with a stop above 1.3205 which was never hit. The first target in the 1.2950 area was only hit yesterday. Those who though the BCE rally was the start of the move higher of the Euro were mistaken (of course Fitch downgrading Italy was already ‘known’ the day of the BCE rally). There is still a possibility for price to continue through the 1.2900 area and pierce the 1.2700 level, in which case we can anticipate a retest of the 1.2130 area of support.